Niger with its capital Niamey is located in Africa (Western Africa, southeast of Algeria). It covers some 1,267,001 square kilometers (slightly less than twice the size of Texas) with 19,245,300 citizens. French, Hausa and Kanuri are the common languages used in Niger (consider regional differences). Algeria, Benin, Burkina Faso, Chad, Libya, Mali and Nigeria are bordering countries. Niger is an arid, landlocked country of the Sahel with a population of 12 million. Niger's economy centers on subsistence agriculture, animal husbandry, reexport trade, and increasingly less on uranium, because of declining world demand. The topography is predominately desert plains and sand dunes with flat to rolling plains in south as well as hills in north. The average density of population is about 15 per km². The climate in Niger can be described as desertmostly hot, dry, dusty, tropical in extreme south. Potential natural disasters are recurring droughts. To reach someone Niger dial +227 prior to a number. The local cellular networks are operated on 900 MHz, 1800 MHz. Websites typically end with the top level domain ".ne". If you want to bring electric appliances (e.g. battery chaarger), keep in min the local 220 V - 50 Hz (plugs: C, D, E, F). The sign for the locally used currency Franc is XOF. 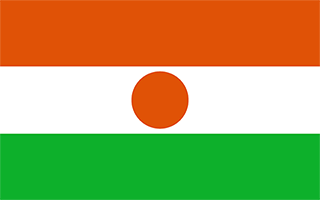 Three equal horizontal bands of orange (top), white, and green with a small orange disk centered in the white band; the orange band denotes the drier northern regions of the Sahara; white stands for purity and innocence; green symbolizes hope and the fertile and productive southern and western areas, as well as the Niger River; the orange disc represents the sun and the sacrifices made by the people.